Windsor Marquees offers the highest standards in marquee hire in the Cirencester area, priding ourselves on personal service, care and attention to detail. We aim to make your event a perfect and successful event. We specialise in marquees and accessories hiring and our dedicated staff are here to ensure you can relax and enjoy your day, whatever the occasion within Cirencester and its surroundings. Once one of the regional capitals of Roman Britain, Cirencester is a well maintained, historic and relaxed market town, with the street market still held twice a week throughout the year. With a population of around 19,000 people and thousands of visitors every year, Cirencester is a busy yet tranquil town in the depths of the Cotswolds, with the town even being known to many as the Capital of the Cotswolds. .
Cirencester is home to the award-winning Corinium Museum, the parish church of St John Baptist and the arts centre is well worth a visit, with workshops in a converted brewery, staging regular craft fairs. 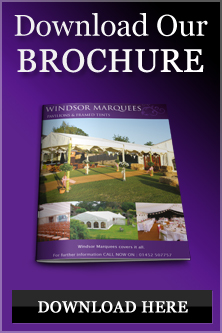 Windsor Marquees have been hiring marquees in Cirencester for many years, serving businesses, leisure facilities, accommodation and entertainment venues with a wide range of marquee and canopy hire. Marquee hire in Cirencester is often used for weddings, business functions, local town attractions and hospitality events.